I really love to embed soap within soap as you have much more control over the outcome of a specific look you are going for. Here I have embedded thin (1/4") sliced logs of cold process soap into a full log of soap. You get nicely defined decorative elements that are showcased when embedded in a larger loaf of soap. You can also so this using individual molds, but must make sure that the embed is not completely buried by the surrounding soap. The above two soaps were created using a two step process. First the embeds were made by using an "In The Pot" swirling technique then poured into my 15" silicone log mold - unscented. I did not fill the whole mold, but instead formulated to fill it about 2/3 full. Allowed that to sit for 24 hours to set before removing it from the mold. After 24 hours (this time is dependent on your formulation - mine sets up pretty firm after 24 hours), it is removed from the mold and sliced into 6 long pieces lengthwise. Next, make a batch of soap for your base. 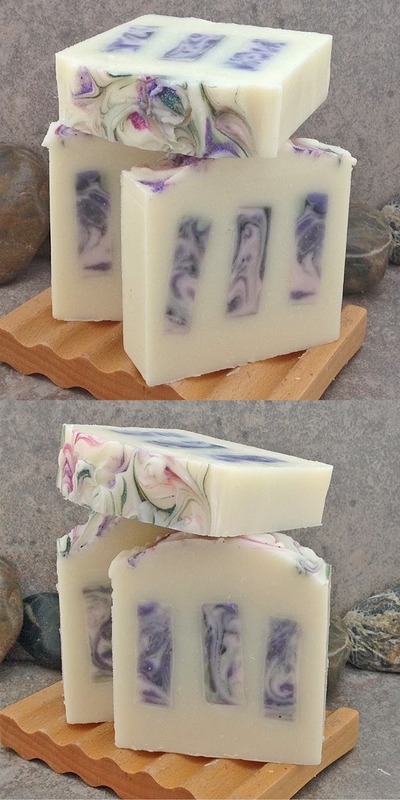 You want this soap to get to a medium trace to pour easily, but be thick enough after you pour it to insert the embed logs without them moving around or sinking. Choose a scent that will not discolor (or accelerate trace) if you want your embeds to really pop or color coordinate based on the colors you chose for the embeds. Pour the base soap 2/3 of the way into your mold. Carefully place the embed logs starting in the center as it will push the soap outwards and upwards. Then place the remaining embed logs. Tap on a hard surface to remove air pockets. Pour the remaining soap (or spoon if it is too thick to pour) to fill the rest of the mold and again, tap on a hard surface to remove any air pockets. Next, decorate your tops. Here I had extra soap so I built up the tops to extend a bit above my mold and did a surface color swirl with coordinating powdered colorants. The powdered colorant is mixed with one of the oils used in the formula (I also added some cosmetic grade glitter to them too for a bit of sparkle) then added by small drops onto the top of the soap and swirled just in the very top layer. The oil will soak into the soap and leave the colorant in place.